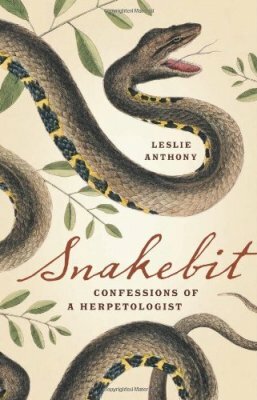 Snakebit: Confessions of a Herpetologist by Leslie Anthony is the latest in a long line of herpetologist’s life stories. Curiously, the prologue introduces us to Anthony in Finland as an adventure-travel writer working on a ski story. Anthony has an encounter with the European viper, Vipera berus. We learn that his past was in herpetology and that the creatures that fascinate us, as a group, also continue to tug at his self. The author mixes a deep appreciation for reptiles and amphibians, science, mythology, and his own personal background in a well-written story. This prologue is a perfect synopsis of what is to come but I also found it left some issues unresolved. Unfortunately, for me, I found myself stuck on his own questions as to why he was no longer a herpetologist. Anthony’s writing is clear, entertaining, and sometimes poetic. He weaves a good story and I found just a couple of sticking points. However, I also found something unique in his book that I was not expecting. As Anthony takes us through his world and contact with herpetologists he also produces a decent primer on the science of herpetology with representative subjects and chapters. The first chapter begins with his childhood in suburban Ontario and his first impressions with reptiles. It is a familiar theme, I think, to most of us. He waxes about his early days in fields, abandoned buildings, railroad tracks, and old quarries with the freedom of childhood affected by books and tales of those adventurers before us. He introduces the reader to the uncanny ability of snakes to escape any confines imagined by a kid, the familiar odor of snakes in hand, and sometimes frustrated parents trying to corral this enthusiasm that Anthony describes as a “sick fondness”. But Anthony also manages to weave in excellent basic biological information on garter snakes, snapping turtles, DeKay’s snakes, milksnakes, and other familiar animals from his haunts. My only distraction came from this backstory was also tied into an adult revisit to his childhood home. One of my chief complaints, albeit minor, is this timeline that Anthony blurs. Throughout the book I couldn’t simply pin where in time we were. I wanted to have some sort of temporal connection to what was going on, especially since his prologue offered this theme that, no longer a herpetologist (in the academic sense), Anthony was looking for why he had released this past and was now a writer. Chapter two begins with Anthony, again as a child, influenced heavily by the writings of Raymond Ditmars. The reader then finds himself into the beginnings of biology as a study and its early protagonists and the rise of herpetology as a discipline within. Anthony seamlessly jumps back and forth between these characters and his own experiences wandering the halls of the Royal Ontario Museum. Again, experiences familiar to most herpetologists today. Anthony drifted away from the pursuit of things scaly and slimy during his adolescent years but returned while in college. He took a job during his sophomore year doing biological surveys of environmentally sensitive areas knowing that his goal, as best as anyone at that age can determine, was to work outdoors. Anthony, almost unnoticeably, discusses death feigning in snakes, specifically with a local example in the eastern hognose snake, Heterodon platyrhinos, but also evolutionarily with other lineages as well. Anthony then mentions his first encounters with mole salamanders, genus Ambystoma, which would be the focus of his studies in graduate school. He paints a picture repeated in likely every university around the world of eccentric professors, oddball grad students, offices jammed with papers and jars of subjects, and the labs where students would journey from student to instructor. This chapter then flows into likely the most arcane subject, for non-specialists, as he goes into decent detail about evolutionary and reproductive biology of the blue-spotted salamanders, Ambystoma laterale, and Jefferson’s salamanders, A. jefforsonianum. Anthony’s study was to examine the hybridization of these animals and what their polyploidy status meant in the broader picture of evolutionary theory. Chapter four is a busy one. Fresh from graduating with a Master’s degree Anthony takes a vacation on Fiji. By now we have a feel for his style of mixing in personal progress with the science behind addressed subjects. The subjects he discusses are a fascinating mix of island biodiversity and biogeography, introduced species, and parthenogenesis. What I found interesting, maybe telling, was his take on herpetology as a career. Anthony takes a humorous approach to mock herpetologists and their pursuit. I imagine most would admit the truths he points out. Even in my pseudo-scientific circles we find our activities absurd and the players (ourselves) even more so. But it is a fine line between being humorous and insulting. Were he still an academic herpetologist it could be taken that he is just poking light-hearted fun as his career and colleagues. As a journalist I can see his jabs seeming a little mean-spirited. Here Anthony makes the first of several references to the hazards of being a professional herpetologist in the form of fatal snakebites. He even goes so far as to joke about receiving a PhD diploma as a death warrant, his graduating class picture noting, “Most likely to die…soon”, and a neon sign on his back reading “Warning: Herpetologist”. It is a humorous take but considering his current position as a writer and the constant of this theme one has to wonder is he really convinced that this career path is so deadly? Anthony then takes a position as a PhD student under Bob Murphy at the Royal Ontario Museum. As a PhD student Anthony convinces us that his fascination with these animals, specifically his studies on salamanders, is genuine. He artfully discusses the excitement and beauty of fieldwork and the important roles these animals play in ecology. Despite knowledge of his current profession it is easy to see that Anthony truly gets what it means to spend time in the field studying things most people loathe and despise. Future chapters discuss graduate student life, especially the roles of students and professors as characters, Anthony’s position as a drummer in a future Joint Meeting rock opera performance, the evolution and paleontology of reptiles and amphibians, desert herpetology and diversity, genetics, lab procedures, amphibian deformities and declines, breeding behavior of garter snakes, and grueling field work in Vietnam and Armenia, and several other topics. In fact Snakebit reads a lot like a cross between a herpetology textbook and a semi-humorous manual for future herpetologists. Or more accurately a behind the scenes reveal of what is herpetology and who are the people that practice it. He does an excellent job portraying the life as a budding academic and nicely ties in the science using representative topics and subjects. Much of these future topics are covered under the guise of Anthony as a journalist. He leaves academia soon after completing his post-doctoral work. He does supply one reference to his joy found in writing; joking how producing fiction (made up stuff) can be more rewarding than producing the often dry fact-based writings of science. As someone outside the circle of academia I found myself focused on the why of Anthony’s departure from herpetology. Maybe it was because he poetically set it up that way in the prologue. Maybe it is questioning my own, sometimes crazy, pursuit of this hobby of mine. I couldn’t help but focus on the several references to snake bite and death. I found this odd because, while the global pursuit of reptiles and amphibians is dangerous enough, and that chasing after venomous snakes has inherent risks, I can’t see this being reason to abandon ones studies. It is not like every herpetologist is forced to wrestle black mambas in war torn villages. Nor is it fair to suggest that being an adventure-travel journalist is not without excessive risks as well. Anthony is clearly torn about leaving this world and certainly has a passion for herpetology. So it got me to thinking of whom the audience this book is directed towards. If he is writing for herpetologists then I think his experiences are relatively common. The science and biology discussed in the book is fairly well known and basic. Anthony, the journalist, mentions how a joke falls flat when he tells a group of herpetologists that he used to be one, now he just studies them – again that fine line between being self-deprecating and insulting. I think general nature and science readers would enjoy and benefit from this book but in reality few people know, let alone care, what a herpetologist is and what he confesses. I will try to convince friends to read this book. They might understand my own passion a little better. As it ends I find that Anthony never really confesses why he left herpetology. Was it job prospects, freedom to write about something else, money, or as repeatedly hinted at, fear?